The perfect, 20-icon partner for your Adium! 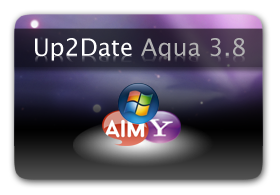 This is the third version of the Up2Date series. Most of the service icons included with Adium are out of date, so here are the Up to Date Service Icons with an Aqua Look & Feel! Note: The Skype and Xfire icons will replace the default icons for the Xblaze and Skype API plug-ins. If you want these services, please download the plug-ins. Another Note: The new Facebook icon is designed to work with Adium 1.3 and above which includes a Facebook service. If you haven't already, upgrade! • Finally found and updated the Novell GroupWise icon to reflect the official one. • New Tencent QQ icon added to reflect the change to a newer icon by Tencent. • Newly designed SIP icon. • Updated Jabber icon: Slight coloration change (now more orange than yellow), cleaner, smoother circle & sheen, fixed rough edges. • Updated LiveJournal icon: Slight coloration change (now the light and dark blue seen in the logo), cleaner, smoother circle & sheen, fixed rough edges. • Updated Napster icon: Smoother, fixed rough edges. • Updated Xfire icon: Smoother, fixed rough edges, made X and swishes darker and lighter respectively for better visibility when at small scale. • Updated and aquified the Gadu-Gadu icon to coincide with a revised logo. • Updated the ICQ icon to better reflect the official icon (was previously the last original Adium Aqua icon). • Added aquified SIP/Simple icon. • Added Xfire and Skype icons! • The new IBM Lotus Sametime icon has been added. • Made the .Mac and Group Wise icons bigger (better quality). • Made the Group Wise logo aqua! • The AIM icon has been re-done from scratch. It should now be clearer. • Made the LiveJournal and Jabber logos different colours so they're easier to tell apart. • Updated QQ logo, now at a higher res. • Added more icons to correspond with the new IM services included in Adium X 1.0. • Fixed AIM icon (now more red than pink). Very nice, the AIM icon is much better. I would love these, but the edges of the AIM and Windows Live Messenger need to be cleaned up. They don't look so hot on a dark background. Great job! This is my favorite service icon set. I like the Mac partly because everything is so stylish... and this definitely carries on the tradition! Keep it up! I use to think this set was done fairly poorly, but the new version (3.x) looks awesome! The rollovers/tooltips on the contact list show a smaller version of these icons--the new AIM icon isn't very clear, any way to sharpen that up a little? what are the two other contact lists shown in the pic? AIM is really washed out and hard to see. This icon set has some promise. heheh! now these look great! good job! Can you make an alternative set with the windows live icon a bit less dark? Awesome! These look just about as awesome as they can be now! The AIM icon was what bothered me and now it looks just about perfect. Hmm, this icon pack is excellent, but I must add that I like the modern logos pack just a tiny bit better due to Windows live icon seems a little brighter/lighter. I believe the reason for that is due to the fact that it doesn't include any circle around it. Anyways, one thing I would love to see though is if someone would make a new service icon pack with the yahoo icon being their smiley face (as in Window's yahoo messenger 7 system tray icon), Windows live being their blue guy and AIM be their yellow guy with the AIM bubble (as in their newer Windows system tray icon). Hope a new MySpace IM one is on the way. Great icon pack. Thanks. Unfortunately, the new MySpace icon is in a plug-in (called LibPurple), and is not affected by an icon pack. If there's any way to change this without hacking Adium, could someone let me know? Scratch that. :) I found a way! I'll look into the Skype and Xblaze. thanx ... I reallllly love these! the skype icon was before just horrible. Especially the "S". The XFire icon is even better than the original one! I even think, that this is the only xtra, that haves Skype and xfire icons too. Keep on working! I really love it! Added a Facebook icon! Rather than (as the icon designers have done in the Beta) base it on an old Facebook logo, I have based mine on the current Facebook favicon (which is the only thing to go by since Facebook's logo is just a stylised 'Facebook'). I created it myself by cobbling the stylised 'F' used in the Facebook logo and drawing the rest by myself (the resultant full-scale image is around 360px square). Hope it's OK - I did it 'cos I recently got myself a Facebook account. And thanks (again) to 776jvacek for the heads-up! Really fits into my buddy list. thanks! AIM seems to have switched back to the running man icon. Maybe a hybrid transition version between orange bubble and running man? Thanks for the icons! 5 stars!